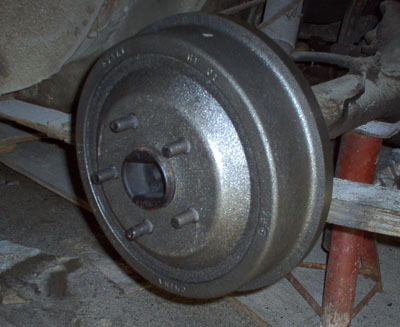 Mustang Brake Rebuilding and Restoration for the early classic pony car is a job you can tackle with a minimum of mechanical skill and tools. 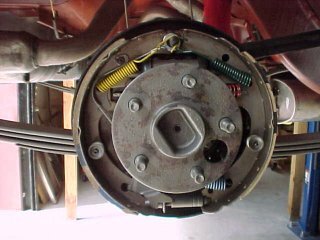 All of the rear drum brake systems for the Mustang from 1964 1/2 to 1970 are basically the same. 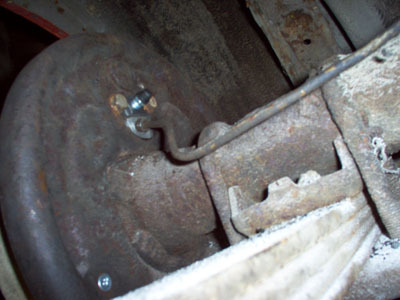 So although the following shows the removal, repair and replacement of the entire rear brake system on my 1965 Mustang coupe for Mustang Brake rebuilding, the procedure is the same for all drum brake equipped cars in this range. 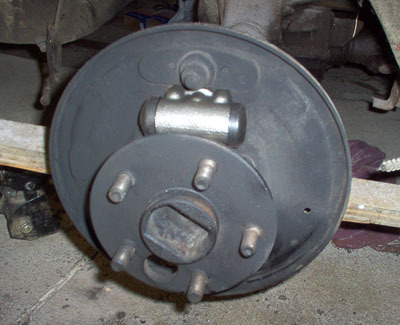 Here is the original rear drum brake set up. For the last 20 years, the car and its brakes have sat in storage. It's ugly and who knows if any part of would be safe to keep after all those years. Having opened the original Mustang master cylinder and finding a substance that looked like rusty pudding, there's not likely much hope for the rest of the system. 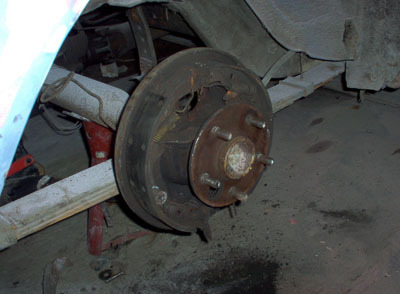 Before I get into the rebuilding of the brakes, we should discuss first, getting the drum off the car. Sounds easy right? Mine wasn't. You see, the previous owner apparently decided to replace the friction at some point and keep the badly scored brake drums in order to save some cash. Not only were they deeply grooved and beyond the point that they could be machined by a shop, they had such a deep groove, that instead of simply removing the wheels and giving them a tug, I had to pound them off with a hammer and chisel. While clearly I had to replace the drums, I soon realized that the previous owner had removed all of the automatic adjusting mechanisms as well. At this point, I decided that the only way to go, was remove absolutely everything and replace it all with new parts. First you have to get those very strong springs off the friction. The hard way, to do your Mustang Brake rebuilding, which is a no cost option, if you have Vice Grips, is to insert the proper spring into the hole in the shoe, grab it with vice grips and pull hard to attach it to the top spring perch. The easy way, is to use brake spring tool (about $10 - $15 bucks for an inexpensive one) and you'll have them on or off in seconds. Then it was time to remove the brake lines from the old wheel cylinders. I'd originally hoped that the wheel cylinders might be saved, but one try at the bleeder screw snapped it off, so that was that. By the way, if your shop or garage is not like one of those squeaky clean and brilliantly lit places like you see on TV, you may want to invest in a set of those cool Bossco Lite Wrenches. They have a bright LED planted inside of the wrench to help you find the nut or bolt easier in dark places. 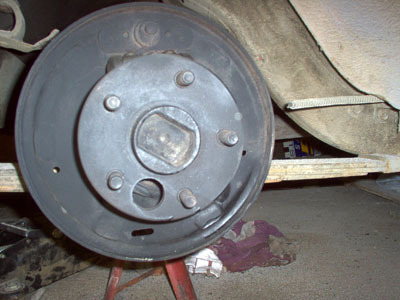 After all the parts were removed, the backing plate was cleaned and painted. Usually, it's covered in a combination of rust, dirt, grease and brake dust. My favorite tool for cleaning things up, is a mini media blaster. It's cheap and does a great job on small parts. The only thing is, that you need to have a small compressor on hand to run it. If you don't have one of these, don't worry, it only takes a bit longer with a wire brush and some good Degreaser or brake cleaner spray. 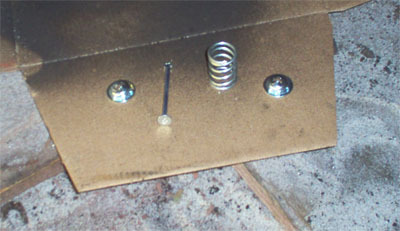 Attaching the 1965 Mustang wheel cylinder is simple. Just remember to keep and re-use the two small bolts from the originals. Set the wheel cylinder into the cutout area and attach it with the two bolts from the back. Mine took a 1/2 inch socket, but yours may not. Important Mustang Brake Rebuilding Note: The wheel cylinders are all different part numbers. There is one for the rear left, rear right, front left and front right. Forgetting this will make the job memorable in all the wrong ways! Nothing major here, except being careful that you don't cross thread the nut on the brake line into the back of the wheel cylinder. Important Note: Unless you are sure your brake fluid is not contaminated or old, it's a good idea to first flush out the entire line from the master cylinder back with fresh fluid before attaching it to the wheel cylinder. OK. We're ready to install the friction onto the backing plate and replace the new tension springs. Now, get your vice grips or brake tool and attach these babies along with the proper shoe to the backing plate. Important Note: Remember to note which shoe (long or short) goes on which side of the backing plate. It will be different from one side of the car to the other because of where the emergency brake cable is inserted. To make it easier to see, I omitted one thing in this picture. Any idea what it was? Yes. The small cable and loop that runs from the top center post around the silver guide at the right and attaches to the adjuster ratchet which limits the movement of the Star Adjuster gear. You'll need to have it on before the blue and yellow springs are attached. Once all these top pieces are added, you can insert the star adjuster at the bottom. Like the wheel cylinders, these are either the left or right sides of the car. Next, hook up the small cable hook onto the slot in the adjuster ratchet and attach the thick spring from the hole in the opposite side brake shoe and into the same slot. 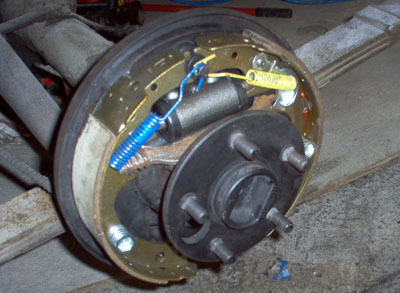 Manually expand or close the star wheel until you have almost a friction fit between the shoe and the brake drum surface when you push it onto the hub. When everything is good, slide on the shoe and repeat the procedure for the other side.